Comprehensive online certification course for instructors. This registration fee is non-refundable, and non-transferable. You will have two-weeks to complete the online training. 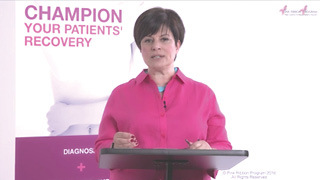 You will be able to download the Pink Ribbon Program Study Guide which is a detailed summary of all the lecture modules, as well as self-study case studies, and patient assessment forms. This course is open to Pilates Instructors, Physical Therapists, Occupational Therapists, Nurses, Personal Trainers, and Lymphedema Treatment Therapists (LDTs). Once you view all modules and pass all the quizzes, you will receive a Certificate of Completion which you can download and print. CECs available. Please Note: This online course requires a computer that supports streaming video. For best results, lessons should be viewed with Chrome 4.0 or newer, Internet Explorer 9.0 or newer, Firefox 4.0 or newer, Safari 4.0 or newer, or Opera 10.5 or newer. Modules 1 through 4 are lecture modules with Quizzes. Modules 5 through 8 demonstrate and explain the exercise protocol. Modules 13 and 14 discuss the importance of Fascia stretch for improved healing and increased mobility and Rebounding exercise as it relates to lymphatic flow.